Welcome to the March 2019 issue of the SfNIRS newsletter. This issue is somewhat longer then usual. For some of the entries, such as the publications section, we have had to go back as far as June 2018 to catch up. Enjoy! This entry was posted in News, Newsletter on March 5, 2019 by Felipe Orihuela-Espina. Did you know that almost 2,000 fNIRS articles were published in the year 2018? In fact, the number of published fNIRS research has been rapidly growing in these two decades. This entry was posted in News on March 4, 2019 by Felipe Orihuela-Espina. This is an executive summary of some of the activity that has occurred in the past few months collected from posts you made to our Facebook group and Twitter. The following compilation includes press notes as well as other resources e.g. youtube videos. Sorting is in reverse ordering to when we first came aware of the resource with newer ones atop. If you know of any other relevant news that you think it should be announced here, please do contact us with the event information so that we can be more comprehensive. For future issues, we encourage you to announce events in our Facebook group or in Tweeter using the hashtag #fNIRSinthenews . Since our last newsletter, we have dedicated some time to easing our internal procedures. A feature story in the Health section of BBC news, dated 18th September 2018, highlighted recent work at the University College London (UCL), United Kingdom, using NIRS for early detection of brain injury in newborns. Around 0.3% of newborn babies in England suffer brain injury soon after birth, due to lack of oxygen during delivery. This percentage increases to 2.6% in babies born preterm (<37 weeks gestation). Around half of these babies later develop disabilities that could have important impact on their life and society. Hyperscanning is concerned with the concurrent neuroimaging of more than one subject simultaneously. Understanding the synchronized activities of brains has important implications to understanding our social interactions whether in cooperative or competitive settings. Neuropsychology and social neuroscience are the obvious scientific field winners. How is your surgeon doing? Imagine a device that we could put on a surgeon’s head to provide insights into his performance in a surgery based on brain activity. Variability in performance might be affected by the surgeon’s emotional/cognitive state, prior surgical experience, and motor skills? Such a technique would enable surgical skill assessments in two critical areas: during training and certification. Wouldn’t that be nice? No, there is no magical device like that yet, but Dr. Xavier Intes and Dr. Suvranu De together with their team at RPI are eagerly pursuing just such a goal. On behalf of the Society for fNIRS, the Communication Committee would like to wish you all the best in this holiday season and the coming new year! 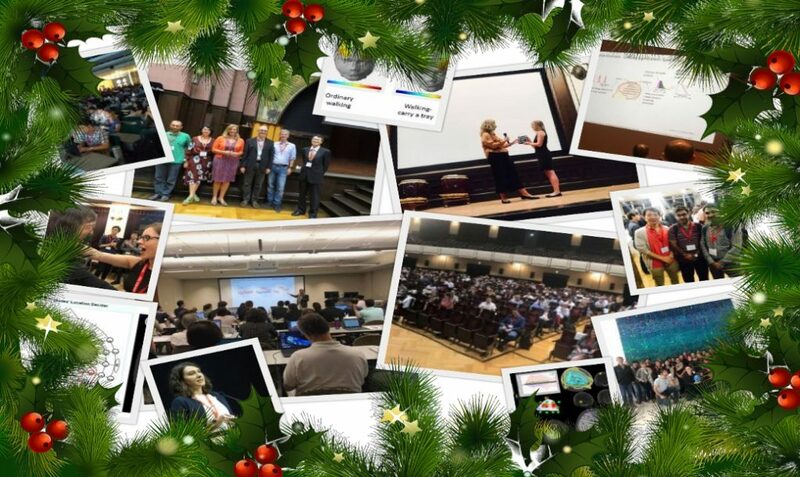 This has been an exciting scientific year for the fNIRS community. The Tokyo biennial meeting made it clear that our community keeps growing stronger every day. New theoretical insights, hardware improvements, data analysis tools, clinical and scientific applications… the advancement is impressive and sometimes it is difficult to keep up to speed with all the happenings. We, from the Communications Committee, are here to help as much as we can. We would like to invite you to post your latest NIRS-related research news in our Facebook site, tweet with the #fNIRS hashtag or, if you like, send us any information about events, jobs advertisements, publications, graduation of students in the field, etc. that you want us to consider for inclusion in the next newsletter. Our resolution for the new year is to improve the way we disseminate all fNIRS related news to maximize their impact. We intend to keep you up-to-date through the maintenance of the society website ( https://fnirs.org/ ) and the continuation of our newsletter. Remember that fNIRS 2020 will be held in Boston on October 11-14, 2020. We hope you have a successful and productive 2019! This entry was posted in News on December 21, 2018 by Felipe Orihuela-Espina.